Scanning electron micrographs (A and B) and histological sections (C and D) revealed that axillary meristems born on plants from the highly branched, perennial DUN population (blue border) grow out as branches earlier than those on relatively unbranched, annual IM plants (red border). Proposed mechanism for divergent development of branches in DUN and IM populations of M. guttatus. (a) Plants from both populations initiate axillary meristems at the same location, frequency and ontogenetic stage. (b) Low MAX expression in DUN plants (relative to IM plants) releases repression of primary axillary meristem outgrowth. High MAX expression in IM plants (relative to DUN plants) represses primary axillary meristem outgrowth. (c) The cumulative result of differential axillary meristem outgrowth generates highly branched plants typical of the DUN population and unbranched plants typical of the IM population. Branching is a fundamental process contributing to shoot architecture and the evolution of morphological diversity. Shoot architecture varies among plant species from the first branched sporophytes of early land plants to intricate patterns of axillary branching among flowering plants. However, shoot architecture is also variable within species, where it influences leaf placement and light interception, contributes to performance, and affects fitness. Variation in the development of branches is subject to natural selection, is an important component of adaptation to novel environments, and was central to the artificial selection that led to crop domestication. Branching is a fundamental process contributing to shoot architecture and the evolution of morphological diversity. Shoot architecture varies among plant species from the first branched sporophytes of early land plants to intricate patterns of axillary branching among flowering plants. However, shoot architecture is also variable within species, where it influences leaf placement and light interception, contributes to performance, and affects fitness. Variation in the development of branches is subject to natural selection, is an important component of adaptation to novel environments, and was central to the artificial selection that led to crop domestication. Understanding the molecular developmental basis of intraspecific variation in branching is critical for understanding plant evolution and may provide important insights for further crop improvement. The genes controlling shoot architecture are well characterized in, and largely conserved across, model flowering plant species. The role of these genes in the evolution of morphological diversity in natural populations, however, had not been explored. I have identified axillary meristem outgrowth as a primary driver of divergent branch number and life history (Baker and Diggle 2011) in two locally adapted populations of Mimulus guttatus (monkeyflower). I then used quantitative real time PCR (qRT PCR) to demonstrate that candidate MORE AXILLARY GROWTH (MAX) genes’ expression strongly correlates with natural variation in branch outgrowth in this species, linking modification of the MAX-dependent pathway to the evolutionary diversification of shoot architecture for the first time (Baker et al., 2012). Current studies include investigating phenotypic plasticity and ecolgical relevance of branch outgrowth (Baker et al., 2014). Friedman et al. 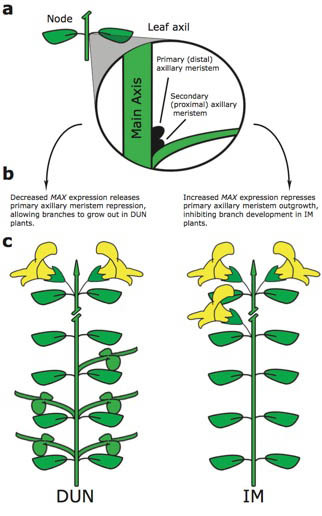 (2015) have corroborated the role of MAX genes in Mimulus branching. I plan to characterize M. guttatus MAX gene function (and other QTL-validated loci) using reverse genetics (Viral Induced Gene Silencing (VIGS) or stable transformants derived from tissue culture), and plant manipulations such as decapitation and reciprocal grafts. Ideally, I will test the effects of these manipulations in field trials to evaluate their effects on fitness as well as examine the molecular evolution at these loci among natural populations.